Mosquito-borne diseases can, at the very least, make you sick for several days or weeks. Some cause intense flu-like symptoms, while others can lead to devastating congenital disabilities. In order to avoid the potential risks of such illnesses, we must protect ourselves from these tiny blood-suckers. The best way to limit these diseases is by staying informed and taking precautions. Why Do Mosquitoes Carry so Many Diseases? What Diseases and Viruses Can Mosquitoes Carry? Female mosquitoes feed on blood, either from humans or animals. If there is any parasite present in the blood, the mosquito will ingest it. It can then be transferred to a new host through the mosquito’s saliva, when she bites her next victim. A mosquito has numerous victims each day, be it the bird in the tree or your next door neighbor; she keeps busy. Of course, this also means she carries quite a few unwanted germs and bacteria that may be present in her victims’ blood. Blood is obviously crucial for both animals and humans to live. Still, this life-sustaining fluid is also the perfect transportation tool for diseases. It contains all the minerals and proteins they need to thrive and reproduce. Fortunately, not all parasites can infect humans. Several mosquito-borne parasites will die as soon as they encounter a human host. One, in particular, is the parasite that causes dirofilaria immitis (dog heartworm). Still, mosquito-borne diseases are no joke. While, for most people, the infection is short-lived, for others it can be deadly. The WHO (World Health Organization) estimates that around one million people worldwide die each year due to these diseases. This fact has earned the mosquito the reputation of being the most harmful insect to humans. In the distant past, mosquito-borne diseases roamed countries across Asia, Africa, and South America. Due to the ease of global travel nowadays, these diseases and viruses have been able to cross borders and have now made their presence known much further afield. However, travelers aren't the only virus smugglers. Environmental changes have allowed more mosquitoes to migrate to the Northern Hemisphere as the climate warms up. While this is not the biggest transporter of mosquito-borne diseases, it does expose new viruses to otherwise 'safe' destinations. Malaria has been around since ancient times. Although they are not entirely sure, experts believe it originated in Africa. People used to think that malaria was transmitted through bad air coming from swamps and stagnant rivers. This is also how the virus got its name, as malaria basically translates to “bad air” in Italian. Malaria remains a dominant disease even today, throughout African countries. It causes mass deaths, mainly in young children. Estimates show that about one child dies every 40 seconds. Malaria is responsible for killing over one million people worldwide each year. Approximately 300 to 500 million people suffer from malaria annually. Those affected mainly include people across sub-Saharan Africa. According to the WHO, 90 percent of the people at risk live within this area of the continent. The sub-Saharan region includes many impoverished rural areas, where access to adequate health care isn't always accessible. The parasite responsible for causing malaria is from the Plasmodium genera. This little family of bugs has several branches all causing different severities of the disease. The P. falciparum is the one to look out for. This is also the type which thrives in Africa. It can cause severe symptoms and possibly death if not treated immediately. Malaria symptoms tend to begin rather mildly, almost resembling that of a common cold. They include fever, chills, and sweats, generally accompanied by headaches and body weakness. Critical symptoms of the P. falciparum parasite include severe anemia, renal failure and unusual levels of consciousness. The affected may drift in and out of a coma or may seem to be hallucinating. Doctors will usually treat this disease with anti-malaria drugs. Most people who receive immediate treatment do make a full recovery. However, the P. falciparum has evolved a resistance toward most medications used. Fortunately, many of the people residing in malaria-infested territories have also developed a resistance toward the parasite. This means that most don’t suffer with severe symptoms. Dengue spreads via the female Aedes mosquito. More precisely, the aegypti and albopictus genera. This disease is most common in tropic nations from Asia to Africa. Sometimes, cases do occur in the U.S., most recently near Florida and Texas. Specialists consider dengue to be one of the more serious mosquito-borne diseases, despite its low death rates. Although the mortality risk is low, the symptoms can be unbearable. The initial signs usually begin to peak around three to eight days following the bite. They are mild to start with, mimicking something caused by a viral syndrome, such as influenza. The affected will likely feel weak and feverish, experience headaches, generally behind the eyes, and joint pain. When the virus progresses, the pain will intensify. Bleeding gums, blood in the vomit, fatigue, restlessness and rapid breathing will also present. Body temperature will begin to decrease, and vomiting will remain persistent. The affected requires immediate treatment to avoid any complications. There is a dengue vaccine which people in risk areas receive. Not all nations have acquired the license to distribute it, however. Chikungunya is another virus transmitted by the Aedes female mosquitoes - aegypti and albopictus. These two mosquitoes prefer to feed during daylight hours, mainly around dawn. Chikungunya is currently present in about 60 countries in Asia, Africa, Europe, and the Americas. It recently made an appearance in northern Italy, and cases have been reported in France and Croatia. Similar to other mosquito-borne diseases, symptoms begin as mild, flu-like signs. As it progresses, severe joint pain develops, which can be debilitating for the victim. Unfortunately, some people continue to experience joint pain even after the virus has passed. Most victims, however, do make a full recovery. Many cases of chikungunya go unnoticed due to the mild symptoms. Often doctors can sometimes confuse the diagnosis with dengue. Fortunately, this virus does not need specialized treatment. Medications generally work to ease the symptoms, as opposed to treating the illness itself ,since it tends to run its course. Yellow fever is most prevalent in Africa and Latin America. While governments keep it under control through vaccinations, about 30 deaths still occur each year. Yellow fever has an exotic cousin which transmits mainly through monkeys. Specialist call this branch jungle yellow fever. The Aedes aegypti female mosquito will feed on an infected monkey and later a human. Symptoms will usually start within three to six days, when fever, headaches, backaches, and shivers occur. A significant loss of appetite and vomiting quickly follows. The advanced stages of the disease involve a high fever, jaundice and severe pain. Some people may experience blood in the vomit and feces. Zika is probably one of the most talked about viruses at the moment. While otherwise quite benign when compared to the others, it does cause devastating birth defects when it affects pregnant women. When the Aedes female mosquito bites a pregnant woman, the virus can cause microcephaly in the fetus. This is a condition which inhibits the head from growing to an average size. In turn, this may cause the brain to malfunction. For the person who has been stung, symptoms will generally only last two to seven days. For most people, they are quite mild. This involves fever, joint pain, eye inflammations, skin rash, malaise, and headaches. West Nile Virus (WNV) comes from a different mosquito, the Culex. We can find this type across Africa, the Middle East, Europe, West Asia, and Northern U.S. The Culex mosquito will contract the parasite from birds and it then proceeds to infect humans. WNV can cause neurological damage, which could be deadly. Unfortunately, symptoms generally don't show until three to 14 days after a bite, when the affected enters a critical phase of the disease. About 20 percent of people with West Nile virus will progress to this stage. Symptoms include headaches, stiff neck, convulsions, disorientation, muscle weakness, coma and eventually paralysis. There is no vaccine available yet, so experts stress the need for personal protection through repellents. Eastern Equine Encephalitis (EEE) is a very serious disease. The parasite causing this virus utilizes humans as their “dead-end host” meaning that this illness is fatal. Symptoms will begin very mildly, like the flu, but soon the virus will attack the central nervous system. By then, it will cause seizures and coma. There is yet to be a vaccine for humans, and EEE is fatal for about half of the affected people. ST. Louis Encephalitis (SLE) is similar to EEE. Fortunately, it is not as prevalent today. The most recent case reported in the U.S. was in 2003. Females from the Culex species are the primary transmitters of this virus, which can be found throughout the U.S. and the Gulf of Mexico. La Crosse Encephalitis is yet another virus mainly affecting the U.S. About 90 cases are reported by medical authorities each year. 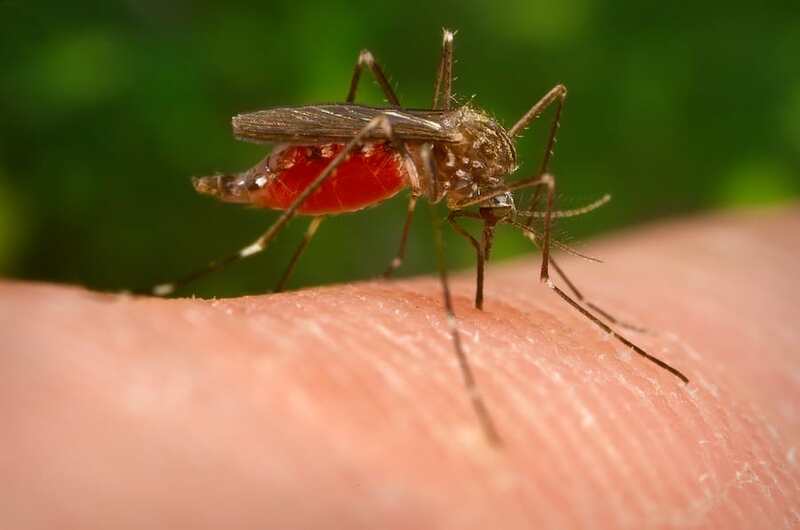 Most fatalities occur when the mosquitoes bite and infect young children. There is also no vaccine available for this mosquito-borne disease, so remember to stay protected.